Red lipsticks are best worn with no eye makeup or with just a ‘classic’ black eye liner. It also looks best when the texture is matte. 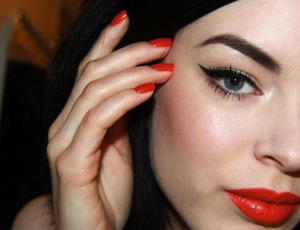 Use a red color lip liner first and fill the entire lip with it. Then apply the red lipstick with a lip brush. Applying a pressed powder on and around your lips would prevent your lipstick from ‘bleeding’.